A Greatly Designed Name Badge Reel With Easy Access From All Directions! The rotatable alligator or badge clips style name badge reels come with 360 degree swivel alligator badge clips for easy access at any direction. You may choose from any of the following hardware attachments: badge straps, badge clips, split keyrings, swivel hooks, spring hooks or universal cell phone string connectors. The RT-09 square name badge reels have a large square area, a great place for your custom printed messages or laser cut custom logos. If you aim to promote or market via mobile advertising, the square reels are your perfect choice. 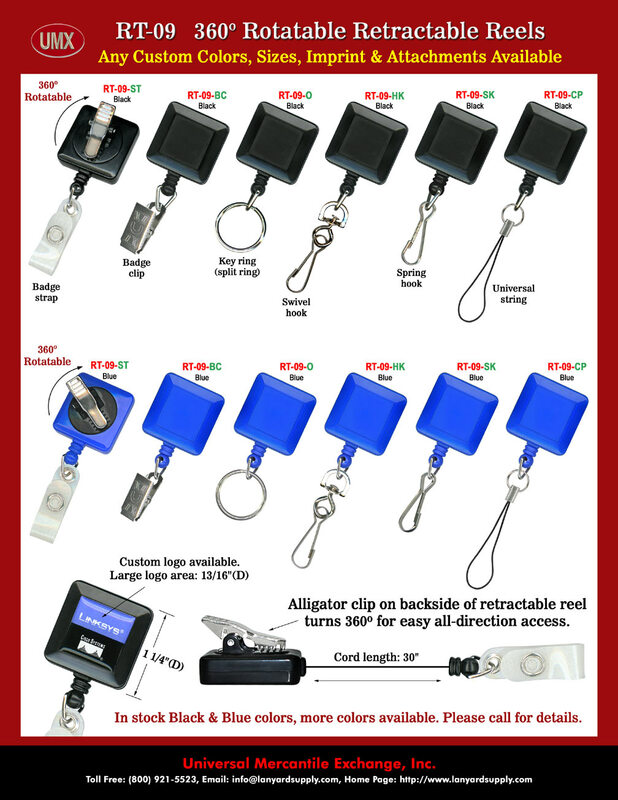 You are viewing Lanyards > Reels > Retractable Name Badge Reels With Square Shape and Rotatable Alligator Badge Clips.